The North County Transit District is on track to get passengers to the Del Mar Races this season. In addition to regular service, a special southbound Coaster train is scheduled on Opening Day to take race-goers to the festivities. 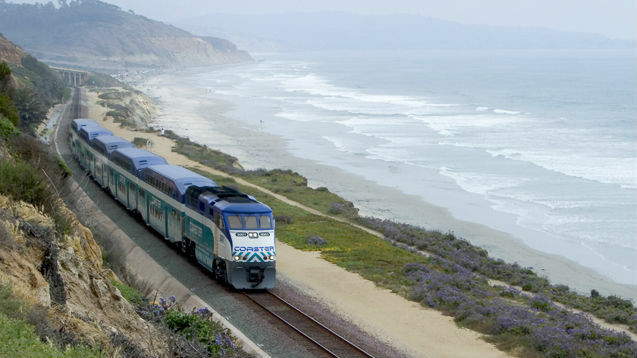 This train departs the Oceanside Transit Center at 11:32 a.m. and arrives at the Solana Beach Coaster station at 11:54 a.m. where passengers can catch a shuttle to get to the race track. The Transit District will also offer the “Pony Express” ticket this year, an $11 ticket that covers your round-trip fare on the Coaster, Sprinter and Breeze, and Stretch-Run admission to the races for one day. This ticket is not valid on Opening Day. Passengers can save time and avoid waiting in line by purchasing their Coaster ticket for Opening Day, or Pony Express ticket for the rest of the season, ahead of time online at GoNCTD.com, or via the Coaster Mobile Ticket app. can also be purchased the day of the chosen race day at any ticket vending machine located at all COASTER and SPRINTER stations. Passengers should also be aware of the Amtrak Rail2Rail blackout days for the opening weekend of the races (July 15-17), and Thursday-Sunday of Comic-Con (July 21-24). During these listed days, Coaster fare will not be accepted on the Amtrak trains listed on the Coaster schedule.